See how easy and fun it is to decorate the inside of an Easter egg. Lots of odds and ends can be used to make these eggs. With a little help from an adult or teen to do the snipping, children can make unique creations as an extra-special Easter treat. Related crafts: To color your eggs, see the Basic Egg Dyeing and the Marbled Eggs projects. 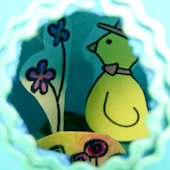 For tiny Easter images to put inside your peek-a-boo egg, see the Easter Egg Holders project. Read all of the steps before starting. With a strong needle or a pushpin, poke a hole in the end of a raw egg. Use small scissors to snip a hole into the egg—about as large as a nickel. Empty the contents of the egg, rinse it and allow to dry. Tip: If you like, color the eggs. See the Basic Egg Dyeing and Marbled Eggs projects for ideas. To strengthen the hole and tidy it up a bit, glue a round or two of yarn or rick-rack around the edge of the hole. Tip: The flower background and the bunnies in the sample egg are cutouts from the Easter Egg Holders craft project. Now the rest is up to the imagination! 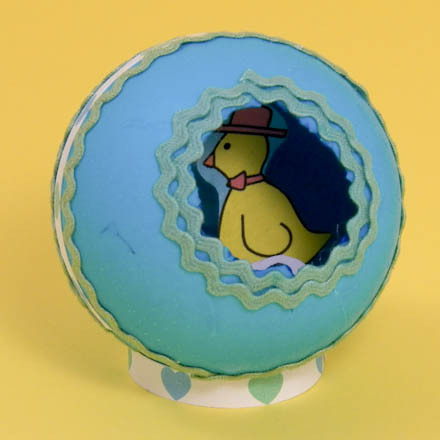 Make the inside of the egg into a scene using tiny plastic animals or tiny cutouts stuck into some fun tack or floral clay in the bottom of the egg. 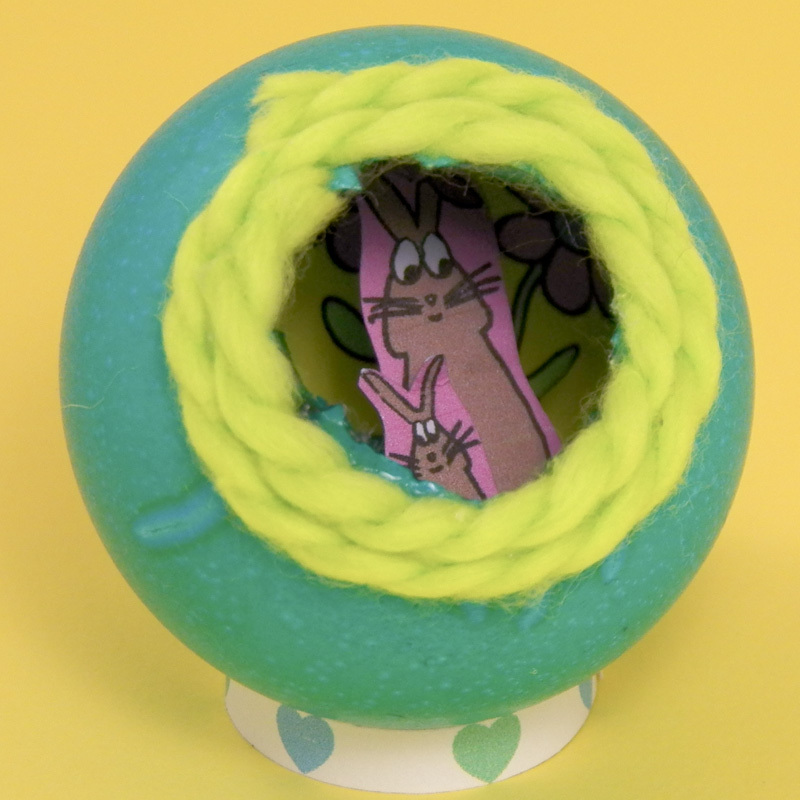 Use bits of cotton and Easter grass glued inside the egg to enhance your scene. Tip: You may find it easier to stick cutouts into the clay if they are first glued to cardstock and/or broken toothpick ends. Tip: For a nice look, add rick-rack around the hole and more around the egg's middle. The flower cutouts inside this egg were made with tiny rubber stamps. The outside of the egg can be left plain or be decorated with stickers or markers. To display the egg, make a holder by gluing a 6" by ¼" strip of paper into a ring; or, make one of Aunt Annie's Easter Egg Holders. That's it! Your peek-a-boo Easter egg is complete! Make a place to work. Read all of the directions. Gather everything you need to do the project. Think about the project. Imagine how it will look and what you will do with it. 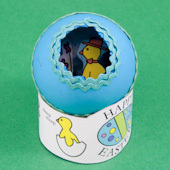 Tip: Display your peek-a-boo eggs in one of Aunt Annie's Easter Egg Holders. Thanks to Judy Zeke, a junior high art teacher and mother of two children, for sharing this craft idea with Aunt Annie's Craft Exchange back in 1996. Judy commented, "Children will enjoy sharing these eggs with friends, peeking inside to see what surprises are in store." Tip: It's fun to take a peek at the miniature world inside a peek-a-boo egg.